6mi My hotel is located right near the Swan River. 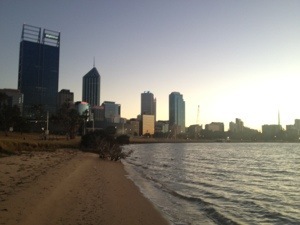 This puts me in a perfect place early in the morning to push out a great 6+ mile run and take some photos of Perth City. I went over the bridge first, putting me on the other side of the river with great views of the city. Even with an early start, I see a few other runners and cyclists meeting up on their Saturday morning to enjoy a workout. I run in the dark on a path that switches from softer than concrete to concrete sidewalk. I took a few pictures of the city and the lights, but it looks so far away from where I am, the photos aren’t that impressive. I come upon a flock of white birds sleeping on the path – I think it’s best if I run around them. Spooking them and having them fly haphazardly up and away could lead to an unfortunate “beaking” or a mass “poop and flight” incident. Don’t want either of those to occur this far from home! 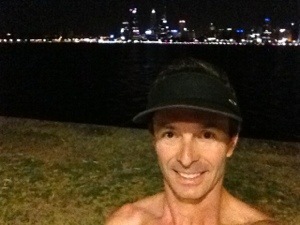 I run around a large curve in the river to a causeway, a four lane highway that goes into the CBD area. It’s still dark out, no traffic and I’m running city blocks now. Sidewalks, signs, bus stops, and very clean streets. I make a pit stop in a hotel to get some water, the reception desk girl is very helpful and asks about my accent and where I’m from. This is a good stop, she gives me a water bottle for the rest of the run! I’m not staying at her hotel, either. 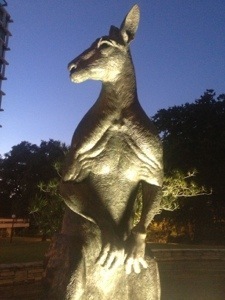 As the sky starts to brighten, I take some pics of the metal kangaroos on the Supreme Court grounds. I make progress through the city and find William St. Since I was out last night, I know where my hotel is, so I head towards the water. I get a few pictures of the sunrise beginning in the east. In chatting with Evan on Google+, he says the bridge to bridge run is a 10k. S my 6+ mile no-Garmin guess was close. Good to get a run in before a demo and store visit this Saturday. Next Next post: It feels so late?